Tis the season for meats and birds and sea creatures and veggies on the grill. Quick weeknight dinners and weekend barbecues with pals. And this? Right here? Is the one sauce you need to get you through. In some ways it is a classic chimichurri, plenty of parsley and garlic and chili flakes, rich extra virgin olive oil blended into a thick paste that is the perfect accompaniment to anything you pull off the coals. On the other hand, I have tamed some of the traditional "heavy on the garlic" blends for my own palate, which craves the brightness of lemon, the mild onion undertone of chives, and the mellow balance of fresh oregano. You can adjust based on what you have, what you like, and how you plan to use it. Working with seafood? Bump up the lemon. Lamb? Swap out the oregano for thyme or rosemary. Veggies? 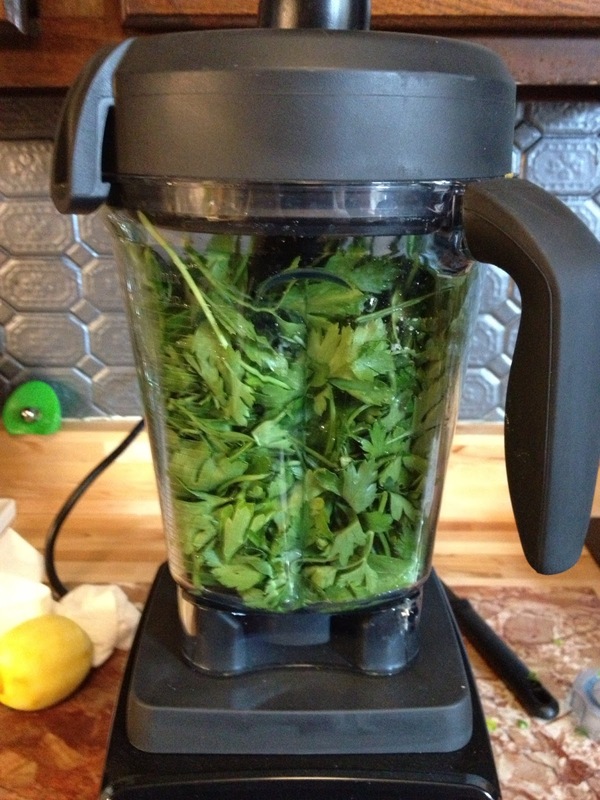 Change out the oregano for basil, smooth it with more oil or stir in some yogurt. It is insanely versatile, and once you get the basics down, you can play with it all summer long. Tonight it will get slathered on some perfect medium rare skirt steaks, along with some white beans with tomatoes and sautéed Tuscan kale. A perfect quick summer dinner with pals. What is a go-to recipe for your summer dining? Pulse until the leaves have broken down and it starts to resemble a paste. Then turn on high and blend until you have a smooth puree. Isn't it insane how that full bowl pureed down to so little? But so much flavor! Store in fridge with plastic wrap touching the surface to prevent browning. Best made the day before for flavors to blend, taste for salt and pepper before serving. Wonderful on grilled meats and vegetables. 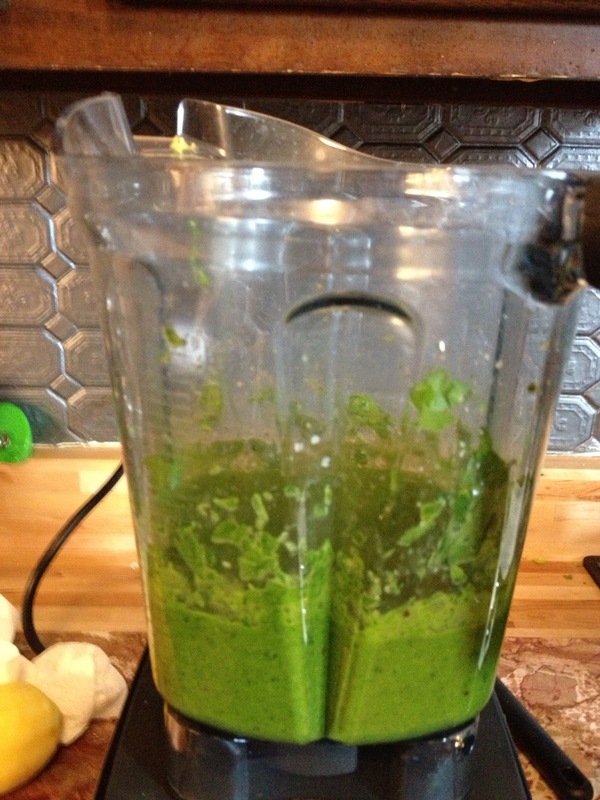 Blend a couple of tablespoons with more vinegar and oil for a salad dressing, or with sour cream for dip. Use as a marinade. A great appetizer is to grill hearty bread, spread with the chimichurri while still hot, then add sliced fresh mozzarella and summer tomatoes. Did you ever avoid something because it seemed doomed to failure? Even though the whole world is touting it's genius? In fact, you avoid it BECAUSE the whole world is touting it's genius? I am not a "go with the masses" kind of girl. Often I look at the masses and think that the future of the human race is tentative at best, and add it as number 472 on my list of why I am delighted to be childless. I'm not a crowdsource kind of girl. Mostly because I don't really like crowds. I like small dinner parties, and quiet bars where I can get a seat and hear the people I am with, and large festivals of any kind make me cringe. I don't go to Yelp to recommend places to me, I go to my friends. Family. People I trust. Because the unsolicited opinions of hundreds of twenty-somethings don't hold any water with me. Especially since we all know that a significant number of the positive reviews are from friends and family of the proprietor and the same number of negative ones are from the friends and family of the competition. The more everyone talks about how AMAZING something is, the more skeptical I get. I have not yet made Jim Lahey's No Knead Bread. I know, I know, since 2008 every cook worth their salt has made this loaf, adapted it, made a gluten free version, I just haven't done it. Partially because I'm not that into bread baking, finding that the best bread I can make from scratch doesn't come close to the perfection of at least seven nearby bakeries, and therefore seems a waste of time. Partially because we are low-carb around here, by medical necessity and not choice, and if the bread is disappointing we will be pissed we wasted carbs on it, and if it is amazing, it will be a horrible temptation. So you can imagine my reluctance when everyone on the interwebs started going insane for Martha Stewart's One-Pan Pasta recipe. "It only takes ten minutes!" "It is creamy and delicious!" 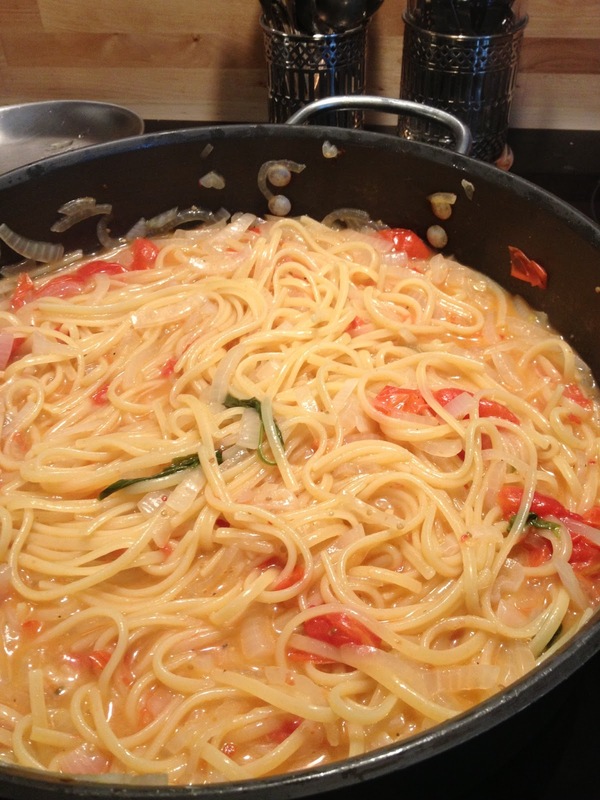 "Best pasta I have ever made!" Hmmm. Piffle. I doubted it. For many reasons. One? While I have some appreciation for Martha, with misgivings, I am not my bestie Jen, whose Martha-inspired life changing year is documented hilariously in her latest The Tao Of Martha, which, if you have not yet read, I highly recommend and not just because I make a cameo appearance or two. But I have found over the years that many of her recipes, um, don't work that well. They need tweaking and changing at a level that means I might as well have started from scratch and made up my own. When they work, they are great. But seven times out of ten? Meh. Two? See above re: No Knead Bread. We eat pasta about only once or twice a month. It is our special treat and we take it seriously. Wasting a precious pasta night on something doomed to mediocrity? A crime. Three? Pasta in its usual format isn't that hard. Not every sauce takes three days. 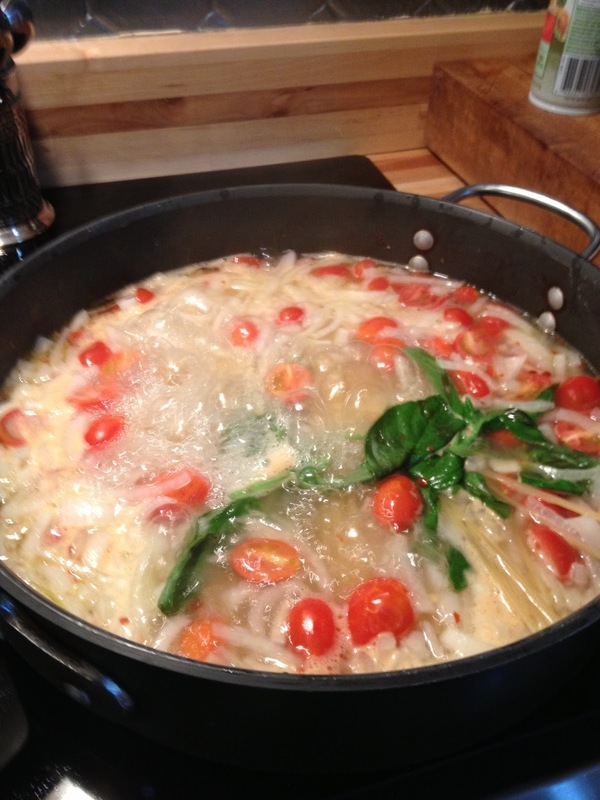 I can usually pull together a scrumptious homemade sauce in the ten minutes it takes for the pasta to cook. Granted, it takes two pots instead of one, but that is why the good lord invented the dishwasher. However, sometimes, your Polymath is wrong. And boy was I wrong on this one. This pasta? Is everything that the world said it is. Easy, fast, DELICIOUS. And while I did tweak the recipe the tiniest bit, you can actually have complete success with the original. Point for Martha. I didn't even plan to make it. We have a spectacular farmer's market in our neighborhood every Sunday. We love it. About half terrific purveyors of fabulous ingredients, and half people preparing yummy to eat on the spot. Carne asada tacos. Apple cider zeppole. Grilled cheese, traditional British banger sandwiches, porchetta...we go, have a moveable brunch, pick up some flowers and produce, and head home. Pretty perfect. So when they announced they were starting a weekly night market on Wednesdays we were stoked! Especially since we are often out of town on Sunday mornings and miss the market. We made plans to walk over the first night, excited to eat dinner there and grab some goodies for the week. And we have hopes that someday that will be possible. As it was, that first night, we discovered a booth playing Shakespeare, three places to sign petitions or donate to local charities, two places to buy baked goods, one place to buy frozen sausage, and one tiny stand with produce. Mostly kale. It took us longer to walk there than to walk the market and we left within 4 minutes, starving and disappointed. And then I remembered the pasta recipe. We always have tomatoes and basil around in the summer. And onion isn't hard to come by. Loads of pasta in the pantry. And if it worked, we'd have dinner faster than if we ordered something in. So I gave it a shot. And it worked like a dream. Charming Suitor loved it and demanded that we put it in regular rotation for our rare pasta nights. I was truly blown away by the results, and made mental apologies to the masses for snarkily assuming they were idiots. I left out the garlic in my recipe because I think the flavor gets a little insipid, and I wanted the other flavors to shine. In winter, I might add it back in. I also found that depending on your brand of pasta, local humidity etc. you may need to adjust the water. I used Barilla the first time and the water was perfect. But I used DeCecco the second time and needed more. This is easy to do on the fly, so no worries. I upped the tomato quotient a bit since they are in season and amazing, so I wanted more tomato flavor to balance the onion. You can see the original recipe through the link above, and I encourage you to try both her way and mine and enjoy the equally lovely results. I'm still waffling on the No Knead Bread thing, though. 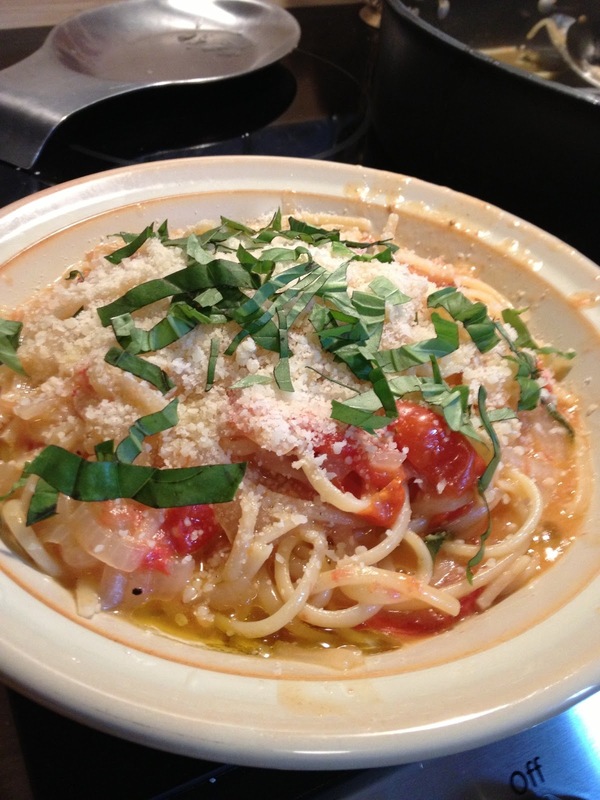 Grated parmesan, chopped fresh basil, and extra virgin olive oil to garnish. In large straight-sided skillet, combine all ingredients and bring to boil over high heat. Boil, stirring frequently with tongs until pasta is al dente and water has nearly evaporated. If you taste for al dente and it isn’t there, but the liquid is almost gone, just add a little more water, maybe a half a cup and keep going. The dish is done when the pasta is cooked and the sauce has reduced so that the dish is not soupy, but not completely dry. Remove basil sprigs and discard. Season to taste with salt and pepper, garnish with grated parm, torn fresh basil and a drizzle of oil.